Magnetic Gauges | Magnetic Level Indicators | Liquid Level Sensors- Chase Controls, Inc.
K-Dyne manufactures magnetic level indicators. 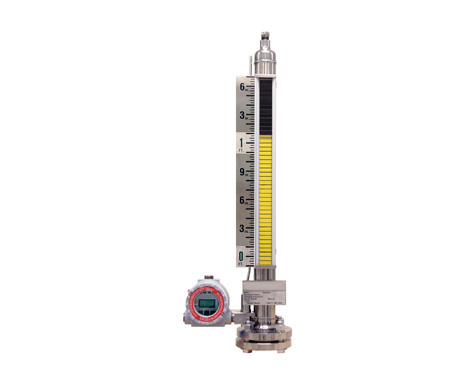 Magnetic level indicators may be used just for sight level indication or; when incorporating a level transmitter or level switches, a magnetic level indicator may be used for level control. The magnetic level indicator incorporates a non-ferrous chamber and can be fabricated to any length up to 20 feet with a standard specification of 2.00 inch, Schedule 40. Larger diameter and higher rated chambers are available depending upon application requirements. The external level indicator is hermetically sealed and is available in a Wide Flag design. Each level indicator type contains its own magnetic assembly that is balanced with the internal float. This generates a strong magnetic circuit that ensures an accurate and constant level indication.